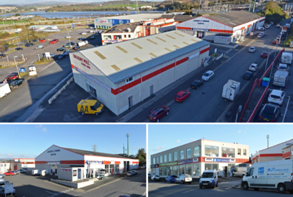 Caisson Investment Management and their JV equity partner Parabola Capital have acquired Faraday Mill trade and Business Park in Plymouth for c.£6.3m. The property consisting of 68 units across a Trade Counter estate and Small Business/Retail Centre totals 192,219 sq ft. The transaction represents a net initial yield of 11.72%, and with a c.50.00% void is expected to rise to a reversionary yield of c.13.91% once fully let and refurbished.